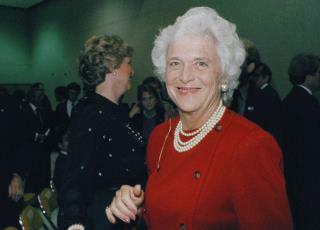 (Newser) – Barbara Bush didn't hesitate to tell people that her trademark pearl necklaces were fake. Americans liked that everything else about the snowy-haired first lady was real. The wife of the nation's 41st president and mother of the 43rd brought a plainspoken, grandmotherly style to buttoned-down Washington, displaying an utter lack of vanity about her white hair and wrinkles. "What you see with me is what you get. I'm not running for president—George Bush is," she said at the 1988 Republican National Convention, where her husband, then vice president, was nominated to succeed Ronald Reagan. Mrs. Bush died Tuesday, the AP reports, citing a statement from family spokesman Jim McGrath. She was 92. The Bushes, who were married on Jan. 6, 1945, had the longest marriage of any presidential couple in American history. And Mrs. Bush was one of only two first ladies who had a child who was elected president. The other was Abigail Adams, wife of John Adams and mother of John Quincy Adams. "I had the best job in America," Bush wrote in a 1994 memoir describing her time in the White House. "Every single day was interesting, rewarding, and sometimes just plain fun." The publisher's daughter and oilman's wife could be caustic in private, but her public image was that of self-sacrificing, supportive spouse who referred to her husband as her "hero." In addition to a follow-up memoir, Bush wrote two other books; she had six children, one of whom died of leukemia at age 3. Click for more on her remarkable life. As Americans we should never feel too distant or too small to add words of recognition and gratitude and to celebrate Our own who do good. God bless Barbara Bush and the Bush family in their hour of loss. America can be proud and happy that her time on Earth and in Our Land brought so much good and left such admirable example. She goes to her reward and WE enjoy the reward of her having been.